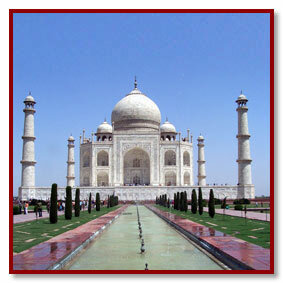 The Taj Mahal the most elaborate monument ever built for love is a mesmerizing monument of pristine white marble. The structure is of pure white marble which gives a silver radience in the soft moonlight, at dawn one can see it change colour to a shell - pink glow, and at the close of the day, takes onthe tawny, fiery hue of the majestic sun. This seventh wonder of the world was built by Shahjahan in the memory of his beloved wife, Mumtaz Mahal, the lady of the Taj, who died giving birth to their 14th child. This great monument was Arjumand Banu's last wish to her husband. The construction of the monument started in 1631 and ended by 1653. About 20,000 people were recruited to give shape to this poetry in marble. The main architect, Isa Khan, came from the far off country of Iran. Shahjahan's intention to build a second Taj of Black marble as his own tomb a negative image of the white Taj, was shattered when he was imprisoned in the Agra Fort by his son Aurangazeb. The last days of Emperor Shahjahan was spent in the Agra Fort from where he could see the Taj Mahal, his wife's final resting place a cross the river. The Taj is a symbol of eternal love built in the loving memory of Mumtaz by the heart-broken Shahjahan who was also burried and reunited with his beloved wife. North india is worst place to visit during summer season so as Agra is. The best time to visit agra & The Taj Mahal, seasonwise is from September to March. But if we particularly talk about The monument of love The Taj Mahal in Agra then throughout the year it is open for tourist to visit except Friday. But during the sunset & sunrise - is the best time to be there for most amazing picturesque view. the Taj mahal is must visit attractions of entire north india because almost every itinerary revolve around it & Agra is prime tourist destinations to visit. Battery van ride is also there to enjoy.